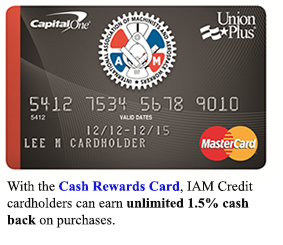 Union Privilege has announced the availability of the new Union Plus Machinists Credit Card designed to meet the needs of IAM members and their families. The new card is available in three options, all with competitive rates, U.S.-based customer service and more. Eligible cardholders have special access to $2.1 million in hardship grants for dealing with an illness or disability, hospital expenses, a strike or job loss. Other Union Plus programs include mortgage assistance, health savings programs, scholarships and discounts for AT&T wireless, car rentals, auto insurance and life insurance. For more on Union Plus benefits and programs, click here.